I’m wondering if anyone out there plays clarinet with veneers on the front two teeth? After completing orthodontic treatment, my ortho and I disagreed on where the incisors should be. Long story short, he didn’t move my teeth the way I wanted, and instead filed the incisal edge. Now, I’m left with teeth that still don’t feel right and they are both now shorter. I don’t like them cosmetically either. Veneers seem like a good cosmetic option to resolve the problem. But I don’t know if they can withstand clarinet playing. Any advice? I had them fitted to both my front teeth since I was 15, then had one front tooth replaced with a crown when I was 17. Dental technology has moved on a fair bit since the '80s when I had all that done, so I doubt it'll have any impact on your playing provided you use a mouthpiece patch as they can scratch up or wear out mouthpieces if the veneer has sharp or square edges to it. Before the veneers were fitted, the filler used to form my front teeth would scratch up crystal mouthpieces due to the quartz content. Thanks Chris. That alleviates a bit of anxiety. Curious, how long did your veneers last? I still have the one veneer now - it's a bit chipped where I bit something metal, but other than that it's still doing fine. I had root canal surgery on that same tooth as it broke off leaving just a stump (result of a cycling accident). So that's held up for 33 years in total now and the veneer has been in place for 31 years. That’s good to know. The orthodontist does NOT want me to consider anything cosmetic (though he is the one who caused the problem) as he doesn’t think it will hold up to the clarinet playing. However, the cosmetic dentists I’ve consulted with don’t see any problem with the veneer and the clarinet. And they also say they rarely have to rebond veneers. Thanks for the information! I Have worn the back of my front top teeth until They chipped and were uneven. This actually caused uneven wear on my sax and clarinet mouthpieces. The dentist "filled" the teeth with ceramic filling material. It holds up pretty well, but I had to have them patched up a little after about 4 years. I love them and would do it again. Thanks Jim. I’ve asked about lengthening the teeth with cosmetic bonding, but they’ve all told me it doesn’t work well to add length. I’m still researching as that’s definitely more cost effective! I'm gonna have to add a few things, studying dentistry in the 8th semester and having learned a few things about orthodontics, too. First of all, it is NOT indicated to prep an completely functional and esthetically sufficient tooth, unless the specific case demands it. When did your orthodontic treatment start? Did you have a deep bite, was there generally too much overbite (vertical relation)? What was your wish regarding your front tooth? Ie., did they have to be more pro/intruded, did you want them lower/highger? You have to be aware that at a certain point and without certain pretty uncomfortable and/or costly appliances, your teeth cannot be that easily moved vertically. I do wonder why he'd shorten the incisor edges, but assume that was because of them making contact with your gingiva (which can have some serious periodontic consequences) If this is not the case, you should seek another orthodontist. Generally speaking, if the ideal overjet (horizontal relation) is 1-2mm and the ideal overbite is 2mm; should you come any close to this, there isn't much that can be or should be done (apart from crown lengthining if you find your marginal gingiva unpleasant). Please do not delude yourself into thinking veneers will make your teeth "better". These terrible youtube videos of people praising them, especially the cheap composite ones are just so wrong on many levels, because they disregard both the limited durability and the loss of healthy substance that you pay with, apart from the money. That being said, if you'd like to attach a photo, that'd make it much easier to judge your situation. Veneers can be a great solution, but might not improve your feel when using those incisors. -at least in prosthodontic terms, her front teeth (13-23) are way too big now, being wider than the base of her nose. Up to the last point, any more or less educated dentist would observe this. There are worlds in between what people perceive as good looking and what is "right" in prosthodontic, orthodontic conservative terms. Thank You Christian. I’m still unsure of what to do. But I’ll give you more insight to my situation. 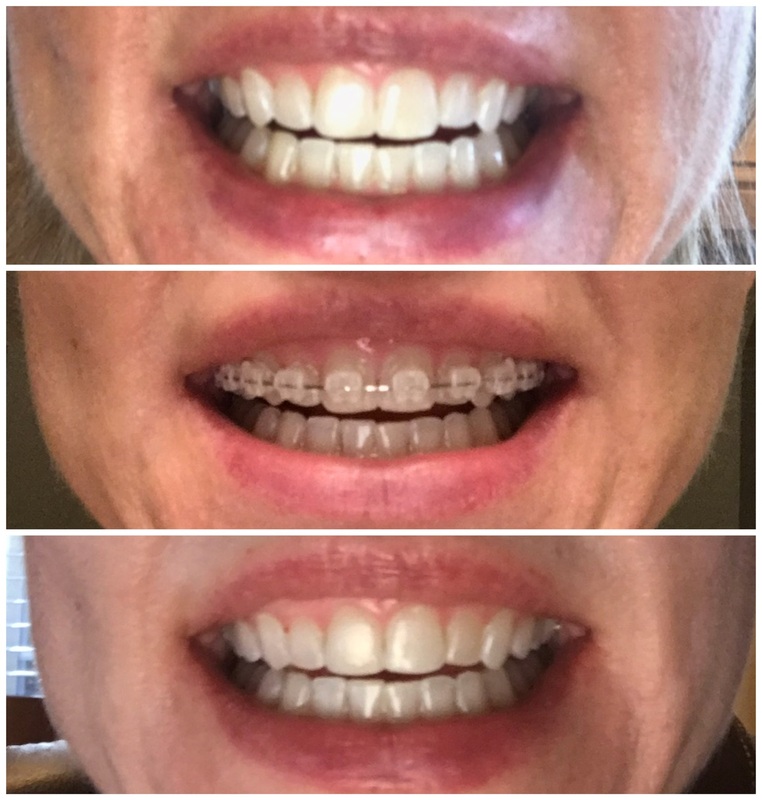 I wore Invisalign for 14 months for crowding and rotations (this included 2 refinements). If only I had left well enough alone! My bite was fine and my teeth were fine, except the rotations in the front weren’t perfect and one of my laterals was still short. The orthodontist suggested finishing things off with braces for 8 weeks. I agreed. After 6 weeks in the braces, a space had opened up. The dentist applied a power chain and scheduled me for braces removal at the next appointment. Two days later I was in the office to have it removed. My bite was off and my jaw was in incredible pain. I now have TMJ symptoms. After 3 weeks in braces, and at each appointment thereafter, I kept telling my orthodontist that my left incisor felt shorter in my speech and my clarinet embouchure. Each time he disagreed and didn’t even sit me up in the chair to look at me straight on. When the 9 week appointment came around, I was sure he would leave me in the braces. I wasn’t yet happy with my incisors and my bite was off! Nope, he took them off, filed on my molars to adjust my bite, and filed my incisors to recontour them. I’m devastated by the results. 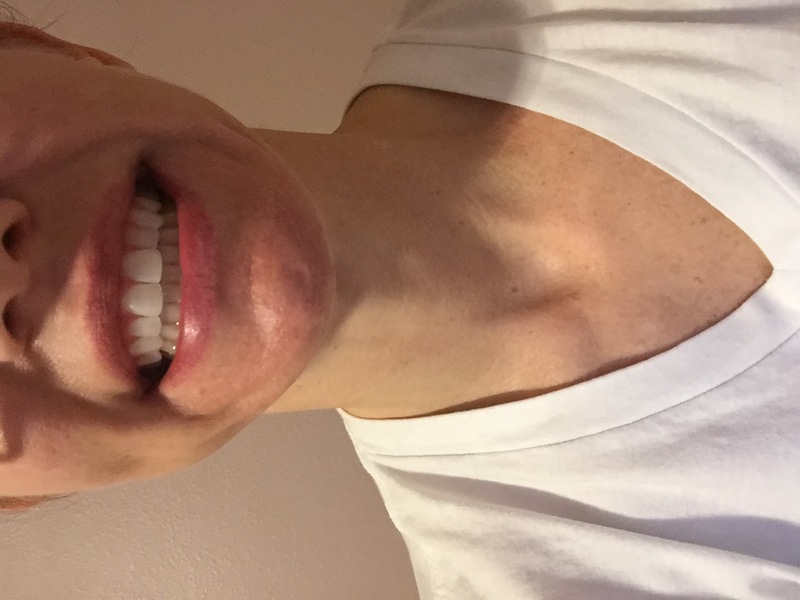 After Invisalign, my teeth were perfectly symmetrical. Now, there is no symmetry and they are still different lengths. I’m struggling with my speech as they are both overall too short. I’m not playing much because of the jaw pain and my incisors are causing me to play off center. I’m not getting a good seal on the mouthpiece playing offcenter. The aesthetics are a secondary concern to my bite and jaw pain. My orthodontist says I need ortho again to correct my bite (which I agree with). As far as the incisors, a respected cosmetic dentist in Houston advised minimal extrusion and recontouring, and possibly slight laser gum contouring to create more symmetry. That’s where I’m at. In pain and devastated my the cosmetic changes of the recontouring. Oh, and my wish was to torque the right incisor towards the center (seemed like it was angled wrong) and ever so slightly extrude the left incisor. This would have felt normal to me. Looks like iatrogenic anterior open bite. It seems like your molars don't occlude correctly, but have a cusp-to-cusp contact when you bite, which is pretty terrible in any situation, filing your molars isn't an option either, cause this form of tooth contact cannot be fix without extreme substance loss. It is possible that you need jaw surgery. Actually, a side view would be very interesting and help determine that, though there are many factors and I'm not going to judge that, it's just one possible therapy form. Why did he have you wear Invisalign, then braces? If anything, it should be the other way round; you'll have to asume poor planning on his side. Actually, Invasalign is the go-to option if the patient wishes for a less visible, but also less flexible (at least for the orthodontis) than a mutlibracket apliance (=braces) which is able to do all the necessary tooth moving. Your front tooth look perfectly fine. No need for veneers and they won't improve your situation. Actually, they look great, it's the bite that needs fixating. No need for gum contouring, people don't notice it anyways on the laterals. Do you happen to know, or can you find out which Angle class you're coming from and whether it is off by the width of less than or more than half a premolar? It is possible, or at least I suppose, that he moved your upper side teeth to the front, creating severe malocclusion. This is more than just short-sighted, if that is the case, I can't say why anyone would do this to their patient. Here's my theory: you might have had a normal intercuspidation, but due to the (probably necessary) corrections of your front, the space opening up was corrected using the PC, pulling your molars to the front by about 1/2 the width of a premolar. If I'm right, this is some severe malpractice. He should have known about the bite changing drastically. Edit: Both these movements you mention in your additional post create even more space. Did he really go and think it'd be close by moving your molars? Adding composite to the approximal contacts would have been one solution. Here's what I think: You have a frontal cross bite, class III malocclusion (your lower canines touch are way to far in the front, cannot comment on the first molars which I cannot see in the photos). He knew you had a severe class III which sometimes requires surgery, or extraction of the lower premolars, then pulling your teeth back. Either way, leaving you with this bite is unacceptable. All was well after Invisalign with my bite. When pursuing orthodontics, he said I was an excellent Invisalign candidate. I needed no vertical movements (except the one lateral, just rotations). The Invisalign results were good, but the front four teeth after two refinements did not have perfect rotations, and the short lateral. The braces were just to perfect things. When he removed the power chain after two days, he immediately said it was because it was only on the top and not the bottom. I think he was hoping I would adjust and wouldn’t need additional hardware. Initially, I believe I compensated enough, as he thought my bite was fine at braces removal. The pictures are not of me ‘biting’. I still have contact, but my lower jaw is having to move back to contact the upper teeth (because the power chain pulls thing back). Now, they have to bring things forward. I had full faith in this office as they treated both of my kids and practically every kid in my town. They are bending over backwards to make me happy at this point. I made sure the ortho knew I was terribly disappointed with the recontouring of my incisors, without even getting to make that decision for myself! And, they caused the malocclusion with the power chain. My incisors May look fine, but they are NOT functioning for me. I’m sure over time they’ll feel less short and my speech will adjust, but I can’t play my clarinet, and that’s a real problem for me. Here is a phot of my bite. Just not aligned right for jaw comfort. I'm really gonna need a side view of you biting, and a frontal view of your "final bite", that is to say, when your teeth glide into whatever contact you can make. What is the bite on the site when you don't force yourself into a certain postion? Anyways, if you have to move back, this'll cause extreme pain and not work at all for a longer period of time. One cannot bite by compensating, your teeth need the correct position, not your TMJ going backwards! It's called centric relation. Why and where are they going to move things forward? Just protruding the front teeth and then pulling the molars forward won't get you out of class III, which needs some serious treatment. Also, the position of both upper and lower incisors seems fine. There is minimal crowing on the lower front. Please elaborate on your incisor problem. Do they need to go lower, do they need to be more protruded?? If it doesn't hurt you, your bite looks just fine in the second photo. Though I cannot tell why your incisors had to be shortened, as overbite was no issue here! It's really hard right now to determine why you have jaw pain. From all the information I have, this can only be because of an incorrect horizontal relation, which needs fixing. You don't have a lateral cross bite at all. Now do I unterstand this correctly? To make the same bite like before, you need to move your jaw back? Well then, congrats, he brought you into a class III, and that's unacceptable, too. I’m not sure of all the ortho lingo, I just know they want to get things back in alignment. I attached a frontal photo of my bite on previous post. Side view will have to wait, about to cook dinner. Incisor problem: they are not level. It is forcing me to play my clarinet off center because I’m not getting even incisor contact. I also need them to be longer. I think that’s why the cosmetic dentist said to extrude slightly. And when done, he would very conservatively recountour for symmetry. And maybe laser the gum line at the incisors if needed for the same reason. Sorry for the lingo, what I'll just need to now: To you need to force your jaw back if you want to bite the way you did before the braces? I'd be extremely careful with doing anything on the incisors. You now got textbook overbite, though leaving them a milimeter longer wouldn't have hurted anybody, so I can't really understand why your orthodontist did that. Any modification to frontal teeth will feel extremely weird at first. A little composite on the edge might now last for long, but can be a good idea and won't take away too much substance. Extruding them orthodontically is no option here for various reasons. Then ask your orthodontist if interproximal polishing (or extraction and mesialization on the lower jaw is an option. Don't see how else we're getting the bite fixed. IPR means creating space for your teeth to move them forward. Extraction of a premolar is the more drastic way, but also creates more space of course. As a double lip player I'm a tad bit confused. First, I don't know anything about veneers, so please forgive me here. However, if a player is biting to the point of putting a hole into the patch with the teeth I have to question the embouchure. I also have to question how sharp are these veneers? Maybe the veneers need to be rounded off? Rounded to the point in which the the upper lip won't get cut if you ever decide to practice for a short time with a double lip. I think to achieve a decent sound sometimes practicing with a double lip improves the upper muscles, even if you only practice for maybe 5 minutes a day. The embouchure muscles will surely improve to a more correct position naturally. So if a hole is being torn into the patches on a mouthpiece I am concerned that the veneers are made wrong and the embouchure may suffer, thus that great sound may not be achieved. I'm fully aware that 99 percent of the players play with a single lip embouchure, however I'm also aware of how well double lip players sound compared to single lip players. I am not saying to switch to double lip, but if you don't like your sound, or if you don't have the best sound in the group you are playing in well try practicing with a double lip a few minutes a day. Maybe for the rest of your life. I promise you that your sound will always be better than most of the players you hear. So I think I would ask the dentist to fix the problem if your upper lip gets really sore after just a few minutes of playing. These would surely be my guidelines with dental work. Hope this helps. Yes I play single lip. My central incisors are no longer level. It’s causing me to play off center, or to rotate the clarinet laterally (think Kenny G). Neither of these embouchures feel comfortable. I don’t have veneers. I was asking if they would be an option for my problem. I don’t have enough tooth structure left in my opinion to file the longer tooth down and have a cosmetic result as well. i would advise you to consider a second opinion from another orthodontist. furthermore, the diagnosis and treatment planning proposed based off a single limited frontal view clinical image is worrisome. They are not treating based on the frontal view photo. They routinely treat TMJ and I have faith they will correct my bite. After my bite and jaw pain are corrected, my biggest concern is the function and aesthetics of my incisors. Since he’s already filed the incisal edge to create symmetry (when the teeth weren’t in the correct position to start with IMO), a cosmetic result is just about gone. I only have so much tooth. Not like you can continue to extrude and recontour, so I fear a cosmetic option may be my best bet. i was referring to the participants on this forum. "However, if a player is biting to the point of putting a hole into the patch with the teeth I have to question the embouchure. I also have to question how sharp are these veneers? Maybe the veneers need to be rounded off? Rounded to the point in which the the upper lip won't get cut if you ever decide to practice for a short time with a double lip." It's more to do with the sharpness of the remaining veneered tooth I have more than biting - the tip is very thin and sharp (plus a bit ragged where it chipped), so it will cut through patches and mark mouthpieces without biting. The crown I have (on my right front incisor) has a much thicker and smoother edge and that slides around on mouthpieces. Anyway, I have what's known as English teeth as opposed to American teeth, so without spending thousands on achieving the perfect smile, I just get on with things as they are in their functional state. There is something to be said for keeping things in their functional state. I wish I had! The Invisalign changes were very slow and only rotated my teeth from crooked to straight, no vertical movements were necessary. Just to “perfect” things, and an orthodontist that didn’t adequately listen to a musicians needs, I now can’t even play!! I tried one of the thicker patches on my mouthpiece today, but that didn’t help at all. I then tried a thinner patch, cut it vertically, and used it only on the shorter tooth. That didn’t work either. I’m so discouraged. I don’t play professionally although I was talented enough to do so. But I still play regularly and am not ready to give it up. I feel like a beginner again. They are definitely board certified, and quite well known in my town. They have treated both of my kids and many friends kids as well. Both orthodontists teach at The University of Texas School of Dentistry in Houston. My experience, in my opinion, is a direct result of the orthodontist not understanding a musicians needs. For anyone else, my teeth would probably be fine. But I had a need to put them in a certain position which I don’t think he appreciated. Keep us posted. This is something we all may have to face one day. Car wrecks, things like that. We never know. Just falling somewhere will knock out a tooth or 2. Thank You for the words of encouragement. It is frustrating for sure. I was on the home stretch to a beautiful smile and still being able to play, and had mentioned to the ortho THREE times before braces removal that my left incisor felt too short. He was insistent it was in the right spot. I guess to appease me, he recontoured BOTH incisors, which I of course did NOT want...it just happened so fast. Now I have two teeth that feel too short with the left still shorter than the right. Just hoping to preserve my teeth with a cosmetic result as well. But from what I hear, these veneers are very strong. As you said, it will be a matter of making sure they are placed correctly for me if I need to go that route. The clarinet travels with me to every appointment now! I'm sorry for too eagerly diagnosing based on too little information. However I briefly discussed your case with an excellent orthodontist at our university clinic and he said that's it , to the say the least, unusual to "finish off" an Invaslign treatment with braces and that this suggests the ortho didn't work correctly in the first place. Recontouring your incisors without your explicit permission however is bodily injury. You should request all the documentation you can get and change your orthodontist. With your joint problems, veneers are NOT the final solution, you'll need orthodontic treatment again. With that being said, your left incisor does look short than your right one, but one could extrude it with braces anyways. I'm not going to comment any further but have to insist that you should try to have them repositioned rather by orthodontic, than by prosthodontic measures. At the end of your treatment, you'll also need a retaining device such as small wire glued to the back of your front teeth. My treatment plan is by another orthodontist, although in the same office. I can’t afford to start over. I am okay with this, as I do trust her. We are doing Invisalign again to correct the bite. She is going to bring the upper teeth forward so that my lower jaw will not have to retract. I’m sure there’s something more technical, but that’s my basic understanding. As far as the incisors go, she is letting me sit in on the Invisalign Clincheck to make sure that I am happy. We may have to recontour slightly at the end, but I can guarantee you she will not do it without my consent! The goal is to make what’s left of my teeth work for me. However, if I cannot achieve both a functional and cosmetic result that I am happy with, at such time I would consider veneers. I like your plan. Nothing more to say really. Yes always bring your horn. As a person with a decent sound, you might want to try playing just a minute a day with a double lip, playing low E. Start at p<f>p. Just that one note. Then maybe record it now and compare it in a few months. See what you think; meaning if the dental treatments are working. If you don't like your sound in 2 or 3 months revisit your options before too much happens to your month. Sure you can play more with a double lip, it's up to you. I just want to make sure your upper embouchure muscles remain strong during this procedure. I just want you to have that feeling of what the muscles are doing. I guess I am saying you might need a reference point. If your upper teeth hurt a lot use a patch, but I often see a major error. Players put the patch too far forward, right next to the tip of the mouthpiece. This is just so wrong. The patch should be at where your teeth are, a shade forward and behind the area. It shouldn't be too thick and it shouldn't cover the whole beak of the mouthpiece. This is actually why I play double lip. When I had braces like yourself, my upper teeth hurt so badly at times and I put my upper lip over my top teeth so they wouldn't hurt when I played. I had no idea that this was actually a good thing in future years. So at a very young age I always sounded better than the other kids. Yes again, clarinet playing shouldn't hurt. It should be a blast. I want you to have a nice sound and really enjoy playing. Thanks for the tip. I’ll try playing double lip and see how it goes. I certainly am struggling to play single lip! When this is all said and done, I will surely not take for granted such a gift. My sound and musicality were always my strengths. Teachers always said I had what they couldn’t teach. I’ll get back to it one way or another! !